You are at:Home»Great Falls Montana»43! Thanks to all for the birthday wishes (twitter, facebook, etc) on Friday – you sure helped make it special! 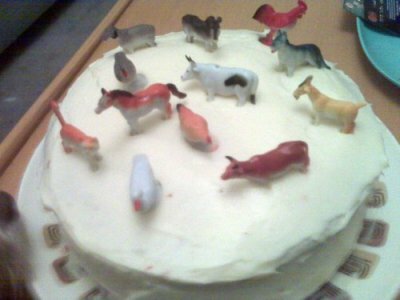 One of the BEST parts of my birthday was this awesome cake from my love, Krista – festively adorned with farm animals! It was the FUNNEST and TASTIEST cake that I’ve ever had! Sheep, chickens, dog, horse, goat, and more! And if you’re wondering: no, they weren’t edible 😉 But it was fun licking the frosting off of their hooves, paws, and claws! Geese? There’s gotta be some geese on there, right? Oh yes – one goose, one duck! Thanks, Julia! where’s the llama? every animal cake should have a llama! Awww! Sorry, Cait – no llama – we’ll try to rustle one up for next year! They’re so cute! Doh, Happy Belated Birthday! (sorry I didn’t get the memo) Glad it was a good one!